Hi Alan, Thank you so much for the great site. I’m learning so much! I haven’t seen anything about poncho-tarps. seems to me like a very good UL gear. What are your thoughts about them? Do you have any experience with them? any ones recommended? Having a hard time picking out a good solution from your amazing informational guides. I’m a beginner just getting started in the Pacific Northwest. Have to go as lightweight as I can because of arthritis – so I’d also be looking at something with livable space as I would spend more time in basecamp. Money is an issue. I’m looking at big rains, maybe snow, winds, & dense underbrush. Prefer something with broad applicability for terrain and weather. Get cold very easily. I’m adventurous and would be up to learning to pitch a tarp. Totally against hammocks, though. Maybe that’s too much to ask all around. Thoughts? Also, have you ever considered a guide for just getting started, super budget? Thanks! 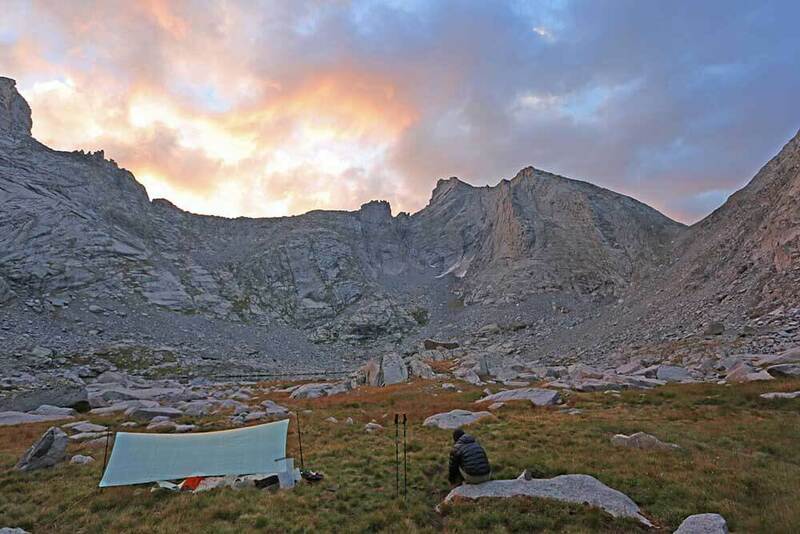 Have you seen or checked out Zero Gram tarp shelters? I had just purchased one with a bug-net and tub. I really like it. I mostly camp in Michigan and we have bad bugs and can get surprise thunderstorm at any the time. It’s is less than 3lbs all together. I would be interested in your thoughts on it. Thanks. Hi Gerry, thank you for posting . 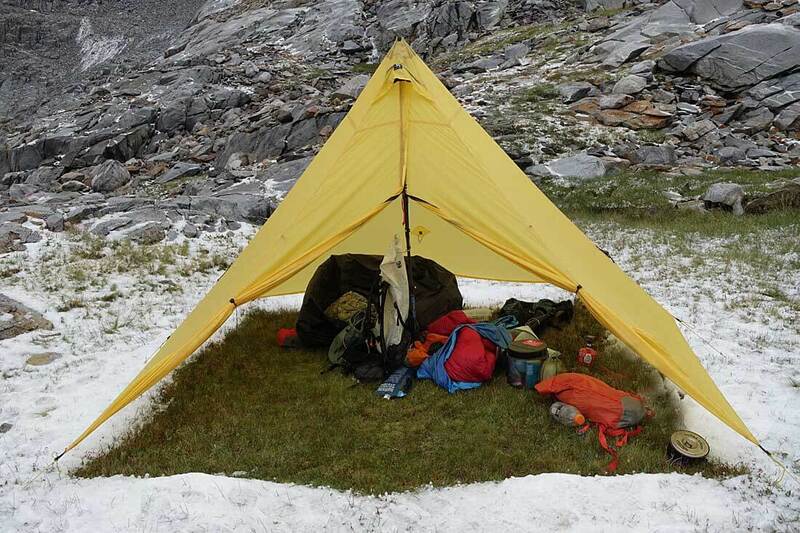 I like the solo Patrol Shelter too (with superlight bivy), especially for the shoulder seasons. Leaning toward a Serenity Shelter under my duo Grace Tarp for warmer weather. And Cuben is totally worth it! I’m considering getting a Duomid for using with 2 people but am concerned about the entrance. It looks like opening the door in the rain would cause one of the occupants to get rained on and since I backpack in the Pacific Northwest, that could be an issue. The other option I’ve considered would be something along the lines of a TT Stratospire 2 which I’d use without the bug nest. The only qualms I have with it is a very large footprint and about $100 more expensive. Would a mid work out in rain or would the extra weight, size and cost of the TarpTent be worth it? Thanks for the quick reply, I’ll look at the XL. This would be my first lightweight shelter purchase and from what I’ve heard MLD doesn’t disappoint. Thanks for turning me on to Tarptent, Alan. I just ordered a 3 person Rainshadow II that will fit me and two of my kids while still being under 3 pounds. Love the site! Keep doing what you do! Hi Alan. Just come across your website and I have to say what a wonderful resource it is for someone like me, who just about to buy their gear in the transition from normal backpacking to UL. Thanks for taking the time and trouble. Looking at getting a flourless tarp or pyramid. Wondering how to deal with water running underneath the shelter? I’ve heard a lot of people talk about site placement and such, but I’m not convinced at this point based off of the things I’ve heard. I really don’t want to add the weight of a bathtub floor to a shelter so I’m looking for help in convincing myself that this is the way to go. Any advice from your experience on how to avoid the running water beneath a tarp and groundsheet? I’ve never really been a fan of sleeping on ground as opposed to using a floor/groundsheet, perhaps due to some bad experiences during torrential storms. I use Zpacks Cuban fibre duplex. No more wet ground or floating away at night. A great lightweight tent. Hi – great info Alan! My preferred combo is a Trailstar with polycro groundsheet and Sea to Summit Nano bug net or Borah Gear lightweight bivvy. With those I can cover pretty much all conditions. However I am being tempted by the HMG cuben 8×10′ flat tarp for a truly ultralight option. Yup Pete, HMG makes a nice Cuben tarp. I just got done sharing one with my climbing partner Don on a long technical canyoneering trip in Escalante Grand Staircase. Pic of tarp is here on Instagram. I just found your website and I have to say it is a top contender for one of the BEST, most information-dense (yet accessible) backpacking resource on the web. And believe me, I’ve been to almost all of them! Your experience is very evident yet you don’t come off as elitist or proselytizing in your views, which is appreciated. I agree with your assessment of shelters. I’ve been using a TarpTent Notch for the last 1.5 years and really like it. It’s the best of the tent and tarp worlds—hence their moniker I suppose. I have yet to experiment with mids, but I think they are the next frontier for me to bring my base weight down to 10 lbs. My biggest hurdle is convincing my WIFE to sleep in a floorless shelter!! She is irrationally concerned about bugs and creepy crawlies. Zpacks makes some compelling tents for 2, but it is hard to justify the cost. Do you use a ground sheet under your mids or just put pad on bare ground? I want to go it under the stars. Sleep on a ground cloth. Maybe even without a sleeping bag 4 nights. It’s springtime in Texas and well it’s rattlesnake and copper head season. I see and read so much about people sleeping under the stars. But what about snakes? Are my “fears” concerns overplayed? How can I help keep myself safe. Both physically and mentally with good sound information from experience? How do you deal with mosquitos with a tarp with no insect screen? Or do you just use a floor/net system whenever in bug zones? It seems like my family always camps in bug zones. We occasionally bring a tarp on a rainy trip for an extra shelter for sitting out a storm. I haven’t tried it for sleeping yet because of the bug factor. Not sure if the tarp we have has a floor/net option. Thank you very much for this informative article. I have a Duomid that I like but when going solo I will often take an MLD Patrol Shelter, an MLD shelter that gets very little exposure. It is not as comfortable as a Duomid but I love that it has such a small footprint,no zippers to fail and is so simple to set up correctly every time. If weather is questionable I’ll carry the MLD Serenity Bug Shelter but will only set it up if I expect lots of bugs or a serious storm. This article needs more Trailstar. The Trailstar is indeed a very nice shaped tarp. It is the primary shelter for a number of my backpacking friends. Did you see that it has its own table entry on the comparison list on this page? And that the Trailstar is highlighted with a photo in the “Recommended Tarps and Shaped Tarps” page? No love for Zpacks? I would say they fit smack in the middle of the tarps/shaped tarps section. I currently use a ZPacks Hexamid Duo tent with extended beak in cuben fiber. With my wife and I, we’ve found the tent cramped and “fiddly” during periods of prolonged rain. Fiddly meaning my home-made clip-in bathtub floor has to be positioned just right to keep rain from dripping off the fabric edge and onto the floor. Maybe the Zpacks made floor would work better. The single door also requires one person to climb over or around the other when entering/exiting, a particular nuisance when answering the call of nature in the middle of the night. I wish I had an opportunity to look at some of the other pyramid tents in person. My concern about a single entry would be similar. With the net tent installed, the MLD Duomid looks like it places the netting close to your face. Also, it’s unclear to me whether opening the single door when raining would allow rain to enter the sleeping area. The diagram for the Duomid XL make it clear this isn’t a problem, but it’s unclear if this would be a problem for the Duomid. With the DuoMid XL, sitting up headroom still appears to be a problem for the person in the back due to the sloping rear panel. For the price and weight of the DuoMid XL in Silnylon, I’m liking the Six Moon Designs Lunar Duo, seems to offer more interior living space at a price significantly cheaper than purchasing a DuoMid + innernet combo in Sil. Good points Jeff. The beauty of a Mid is when it’s used without an innernet/floor (about 95+% of my use is without). Mids are light, and in silnylon inexpensive. The simple, rectangular shape and a minimum number stakes makes or a fast, non-fiddly setup. And you get a palatial area for the weight. I used a SuperMid for two weeks in Alaska’s Brooks Range in the wettest August on record and didn’t use innernet/floor, nor felt the need for it. We stayed dry and happy. I would agree that if you are intent on using bug netting and a floor most of the time, that offerings from Six Moon Designs, or TarpTent may be lighter and less expensive. But then you do loose the flexibilty of the lightweight palace. In the SuperMid, I can put my pants on standing up in the shelter!